Within the energy ecosystem, the transition towards a more sustainable future mostly materializes through rapid increases in renewable energy sources, distributed generation and energy storage at large. The increasing share of intermittent generation sources is redefining the rules of the game – roles and accountability within the energy value chain are turned upside down. 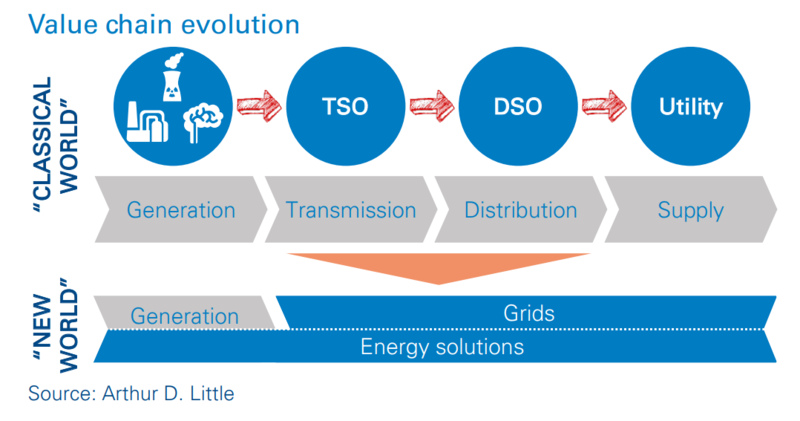 While the traditional role of the electricity Transmission System Operator (TSO) is more relevant than ever, fundamentally reshaping the future is equally high on the agenda, as it is triggered by game-changing factors such as new stakeholders, higher stress on the energy grid, digitalization, intermittence and flexibility. Here we share our learnings from recent Arthur D. Little projects. Renewables and the increasing use of distributed generation sources are stretching the traditional energy grids, which were built to accommodate large central generation units and oneway distribution system operator (DSO) networks. Current prosumer reality has inverted the system, new actors have emerged (e.g., aggregators), geographies are increasingly interconnected, and all ecosystem stakeholders are rethinking their strategies. Specifically, a whole range of “energy solutions” are emerging along the value chain, forcing energy industry participants to rethink their traditional business models. In addition, central generation is transforming, with offshore wind and PV parks that mandate new “transmission highways”, as well as skyrocketing asset investments in energy grid backbones. As a result, the traditional “linear” grid structure is evolving towards a “meshed” structure, and both TSOs and DSOs need to deal with new flexibility requirements and constraints. The need for a transformation at network level is reinforced by adoption of new technologies and use cases such as (large-scale and residential) batteries and electric vehicles (smart charging, vehicle-to-grid), as well as emergence of new electricity generation models such as virtual power plants (VPPs) and demand-side response (DSR). On the one hand, this challenges traditional network operator models, but on the other, it offers opportunities to existing and new players. TSOs: Facilitate ongoing change, or lead the way? More opportunities will arise for TSOs willing to supplement the “classical” world with the emerging “transition” world, in which new priorities exist along four main axes: system operation, asset management, ecosystem facilitation and diversification (see below figure).This overview of opportunities stems from our implication in supporting TSOs in the definition and the development of their ambitions.